There’s something magical about the golden hue of freshly made ghee resting in a Mason jar on my counter. I love the nutty, rich smell of the ghee-making process, and I know, as I dip my knife into the jar to spread ghee my toast or add it to a sauté pan, that I’m introducing this high-quality oil into all of my cells. In Ayurveda, ghee—especially when made from local, grass-fed, organic, unsalted butter—is the purest essence of the earth element. You may have seen ghee in jars on the shelves of your local health food store, or here in the Kripalu Dining Hall, where it’s offered near the Buddha Bar. Ghee (or clarified butter, as it’s known in Europe) is the result of the alchemical process of cooking down butter until the liquid evaporates and the milk solids sink to the bottom of the pan. The ghee is then poured through a strainer or cheesecloth into a sterilized Mason jar. There’s no need to refrigerate ghee, as it’s pure oil and can’t turn rancid like dairy. Read on to learn how to make ghee; If you prefer to buy it, there are high-quality sources online or at your local Indian store or health-food store. Ayurveda teaches us that the consumption of ghee offers a wide range of benefits, including clarity of mind and sound digestion. The Charaka Samhita, one of the classical texts of Ayurveda, says that “the intake of ghee is prescribed for those whose bodily constitution is dominated by vata and pitta, who is [sic] suffering from diseases due to the vitiation of vata and pitta, those desirous of good eye sight, the old, children, the weak, those desirous of longevity, those desirous of strength, good complexion, voice, nourishment, progeny, tenderness of the body, luster, ojas [life-sustaining vitality], memory, intelligence, power of digestion, wisdom, proper functioning of sense organs, and those afflicted with injuries due to burns.” Ghee also “augments intellect and enkindles digestive enzymes, ” according to the text. In more scientific terms, ghee helps sustain healthy microbes in the gastrointestinal tract to promote effective digestion and elimination. It nourishes all the tissues of the body, including the nervous system, translating into calm energy throughout the day. Those of you with a constitution primarily composed of vata (elements of air and space) and pitta (elements of fire and water) will benefit most from ghee, as it nourishes the dry, light, rough quality of vata and the hot, light, sharp quality of pitta. 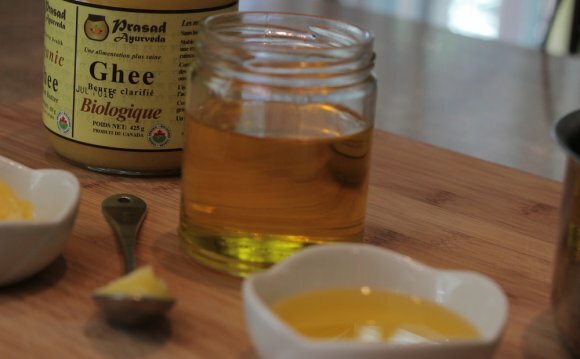 Making ghee is easy, and takes just 15 to 30 minutes, depending on the amount you’re making. All you need is one pound of unsalted butter, preferably organic. Place the butter in a heavy, one-quart saucepan, and cook uncovered over medium heat until the butter melts. Turn heat down to medium-low to maintain a low simmer. Keep a close watch, as the ghee can easily burn. The butter will foam and sputter while it cooks, and whitish milk solids will begin to form on the bottom of the pot. Once the milk solids turn a light golden brown, take the ghee off the heat. Allow to cool for about 30 minutes, and then pour through a fine sieve or layers of cheesecloth into a clean, dry glass container with a tight lid. Ghee can be kept on the kitchen shelf, covered. It does not need refrigeration. Always use a clean, dry spoon or knife when using ghee, as introducing water or food into the ghee will create rancidity. Ghee is excellent for cooking and sautéing. Because it’s is a short-chained fatty acid, it has a high smoke point and thus doesn’t create carcinogenic free radicals when brought to a high heat. This means it’s one of the safest oils to cook with (along with coconut oil and butter). Spread it on toast instead of butter. Add a teaspoon of ghee to your hot breakfast cereal. Add ghee to your coffee—sounds strange, but it’s delicious! Melt over steamed vegetables, potatoes, or rice. Sauté your culinary spices in ghee and add to soups, stews and kitchari. Ghee For Skin Care- A Simple Ayurveda Method-Curejoy.